OXFORD, Ohio – Ryan Larkin had one shutout in his freshman season and one more as a sophomore. Ryan Larkin (photo by Cathy Lachmann/BoB). Six starts into 2018-19, the Miami junior has already blanked more opponents than in his first two years combined. On Saturday, he recorded his third clean sheet of 2018-19, a 30-save effort in a 6-0 win over Colgate at Cady Arena that wrapped up a weekend sweep for the RedHawks. It was the fourth straight win for Miami in the all-time series, as the RedHawks have outscored the Raiders, 18-2 during their winning streak vs. CU and 40-17 overall. MU wrapped up its four-game homestand with three consecutive victories and is 5-1 on its home ice this season. RECAP: Just 2:48 into the first period, Josh Melnick backhanded a pass to Gordie Green at the blue line, and Grant Hutton received a drop pass from Green, skated into the high slot and wired one home on the stick side on a 4-on-4. It remained 1-0 until the 7:49 mark of the middle frame, when Green fed a pass to Melnick from the point to the side of the cage, where Melnick rammed in a bad-angle one-timer on the power play. With 3:14 left in that period, a shot from the top of the right faceoff circle by Alec Mahalak handcuffed goalie Andrew Farrier, and Scott Corbett was there to knock in the rebound on the opposite side for his first career goal, making it 3-0. Melnick and Green connected again, as Melnick threaded a pass through two defenders from the inside edge of the faceoff circle to a wide-open Green, who fired it into the vacant half of the net with five seconds left in a second period that saw MU score three times. Midway through the final stanza, Casey Gilling fed a one-time pass to River Rymsha, who was crossing the blue line, and Rymsha found the top corner of the net as he stepped into a slap shot. Hutton wrapped up the scoring as he eluded three defenders while carrying the puck from the blue line to the slot before backhanding one in to the stick side with 5:03 left in regulation. STATS: Larkin leads all of Division I in shutouts with three. His save percentage of .966 is second in the NCAA and he is third in goals-against average (0.83). His five career clean slates moves Larkin into a tie with Dan Kodatsky for seventh all-time on the Miami leaderboard. Green finished with a goal and three assists for four points, the second-highest total of his career only to his five-point effort vs. Maine on Oct. 20, 2017. It was his second three-assist game as a RedHawk. Hutton ended the night with two goals and a helper, becoming the first skater to score twice or more in a game this season. It was his fifth career multi-goal game and the fourth time he has picked up three points. Melnick also notched three points – the third time he has done so in a Miami sweater – on a goal and two assists. Green has seven points in his last three games including six this weekend and Melnick picked up five points this series. It was the third career multi-point game for Mahalak, who tallied two assists and wrapped up the series with three points. Miami scored in all six periods this weekend and has goals in seven consecutive frames overall. 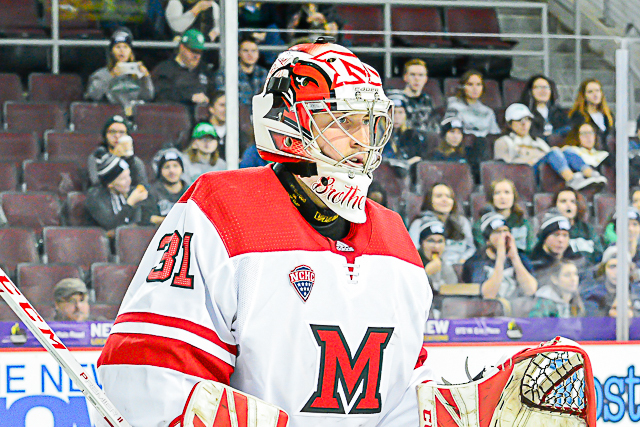 THOUGHTS: Miami played with maximum effort from the opening faceoff to the final horn, as the RedHawks were still bombarding the offensive zone in the closing minutes trying to add another score. Too many times for too many years Miami has had trouble closing out wins, but at least for the first month of this season, the RedHawks have wielded a killer instinct late in games. Colgate didn’t play poorly on Friday but fell behind early in this one and sort of threw in the proverbial towel the final 20-25 minutes on Saturday, and rather than sit back and play not to lose, Miami absolutely took it to the Raiders in the sixth period of the weekend, punishing them physically and on the scoreboard. At this point, the RedHawks are better than Colgate. They aren’t 6-0 better though, but both teams got the outcomes they deserved: Miami didn’t let up the entire game and the Raiders did. And good teams take advantage when that happens. That’s the difference between the first eight games of 2018-19 and their 110 contests the previous three seasons. And that’s what makes this such a big win heading into NCHC play. — Corbett returned to the Green-Melnick line and all three ended up finding the net. They combined for eight points (Green 1-3-4, Melnick 1-2-3, Corbett 1-0-1). We heaped praise on this line for its play on Friday but it was even better in this game at both ends. — This is as locked in as Larkin has been since coming to Oxford. In his last four starts he is 4-0 with a .981 save percentage, stopping 104 of 106 shots. He’s second in the NCAA in save percentage at .966 only to a Lake Superior goalie whose last name is Mitens (how do you compete with that)? And that’s been a big difference in Miami’s start: It’s virtually impossible to have a successful season when your team save percentage is .883 and your starter finishes at .886, which was the case in 2017-18. Quality goaltending can help a decent team become a great one, and while there’s no way Larkin maintains his current save rate, he has the ability to steal wins for the RedHawks. FORWARDS: A. The passing by this corps was so much crisper than in any other game this season. Yeah, Green and Melnick were studs, but their supporting cast was strong as well. Karch Bachman continues to generate chances with his speed. Gilling keeps winning key draws and impressing with his defense, plus he set up Rymsha’s goal. Sophs Ben Lown and Phil Knies continue to play above their size. Zach LaValle is earning playing time by stepping up. Corbett scored his first career goal and plays a high-energy, physical style. Etc., etc. DEFENSEMEN: A. Hutton, Mahalak and Rymsha were the standouts among this group. This was Hutton’s best game at both ends, and probably the same could be said for Mahalak, who picked up two assists and earned some power play time. Rymsha’s goal was an absolute blast with pinpoint accuracy. GOALTENDING: A+. About as perfect of a game as a goalie could play. He turned 30 shots aside and faced some Grade-A chances. He seemed more comfortable going side to side this weekend and gave up almost zero second chances. LINEUP CHANGES: Corbett replaced Johnson, both on the first line and in the lineup, as Johnson was a scratch. Defenseman Andrew Sinard dressed for the second time this season as Christian Mohs sat out. FINAL THOUGHTS: Percentagewise, this equals Miami’s best start through eight games since 2010-11. The locker room is much more unified than in recent seasons. Goaltending has been phenomenal. Defense has been solid. The RedHawks are starting to score goals. Even those in the stands are having a lot more fun, and hopefully more will show up as we enter the cold-weather months and super-skilled league opponents come to town. Miami has a lot going for it, but the RedHawks also haven’t played a true road game yet, suiting up for six at home and two on neutral ice. They also haven’t started league play. MU will tackle both of those obstacles next week in its NCHC-opening series at Omaha. Maybe Miami, picked to finish last in the conference, ends up being the biggest surprise in the NCAA. Maybe the RedHawks do struggle in league play as was predicted. But if they keep up the kind of effort they put forth this weekend, the dividends will eventually come for this program. At least by playing the game the right way the foundation is now being laid for future success. OXFORD, Ohio – Ryan Larkin extended his personal winning streak to three games for the third time in his career, and he stopped 12 shots in the third period – including several high-percentage chances – to preserve the win. He finished with 28 saves as Miami beat Colgate, 4-1 at Cady Arena on Friday. In his last three outings, Larkin has turned aside 74 of 76 shots or 97.4 percent. The RedHawks (5-2) improved to three games over the .500 mark for the first time since the end of the 2015 season. Miami scored twice before the Raiders generated their first marker, and the RedHawks closed the win out with two more unanswered goals. MU has won three straight meetings vs. Colgate (2-2) – all at Cady Arena – outscoring the Raiders, 12-2 in that span. RECAP: Fourteen minutes into the first period, Derek Daschke centered a pass to Gordie Green, who juked before whipping a shot home on the forehand from the slot to open the scoring for the RedHawks. Miami extended its lead to two when Phil Knies snuck home a short-side wrist shot from the left wing 96 seconds into the middle stanza. Colgate’s Josh McKechney netted his first goal of the season with 7:35 left in the second period with one second left on a Raiders power play, cutting their deficit to one. But Miami reestablished a two-goal lead six minutes later when Alec Mahalak sprung Josh Melnick loose up the middle, and Melnick eluded two defenders, penetrated the zone and ripped one over Mitch Benson’s blocker from the high slot. Zach LaValle capped off the scoring for the RedHawks, as he corralled a puck on the left faceoff dot, maneuvered it to the sweet spot and wired one top shelf just inside the near crossbar with 6:19 left in regulation. STATS: Green and Melnick finished with a goal and an assist each. It was the second tally of the season for both. Knies’ goal was also No. 2 of this campaign, and it was the first for LaValle, his first since March 10, 2017. Daschke picked up a career-high two helpers. He and River Rymsha ended the night a team-best plus-2. THOUGHTS: Miami actually started the night a little soft on defense, allowing multiple quality chances early, but overall the team played well all night. The final score is a tribute to the RedHawks’ effort and execution, as Colgate was better than 4-1 indicates. Fortunately for Miami, Larkin was on form from the opening whistle, as he had to turn aside five shots in the first few minutes. Even when Colgate pulled to within one, it never felt like the game was in doubt, and Melnick’s pure-effort goal made it 3-1 and really seemed to deflate the Raiders. — This was Green’s best game of the early season, and he and Melnick showed off their chemistry in this one. And they did so with Carter Johnson as their third, as he moved onto that line with Scott Corbett scratched. Miami’s early-season success had come without huge offensive contributions from the Melnick-Green tandem, but they were a force in this win. — Derek Daschke has seemed to get better every game. His first assist was on a high-precision feed to Green in the slot, and he also picked up a secondary helper on Knies’ marker. — Monte Graham’s faceoff percentage is north of .700 – which is insanely high – and he won a draw in the third period that went right to LaValle, who loaded up for Miami’s fourth goal. Graham was 4-0 in the circle. FORWARDS: B+. Melnick and Green (Grelnick?) were stars 1 and 1a among this corps. Knies and LaValle both found the net on well-located shots. Brian Hawkinson played his grinder role and provided energy. Ryan Siroky was his physical self and played solid defensively. Christian Mohs – limited to nine games last season after knee surgery the previous year – looked a step better than in previous games, especially early. DEFENSEMEN: B-. A little sloppy early but solid enough overall. Daschke was the standout in this group, both with his passing and his shut-down play as his stock continues to rise. Rourke Russell also seems to be in a constant state of improvement as he seems to be gaining confidence every night. River Rymsha has been a pleasant surprise as he impresses with his two-way play and hockey IQ. GOALTENDING: A. Couldn’t see the Colgate goal live and there is no clear replay, so no idea if Larkin had a chance on it, but either way he made some excellent stops early and turned 28 shots aside overall. A strength of his as a freshman was his rebound control, and once again in 2018-19 opponents are rarely getting second chances vs. Miami with him on net. The Raiders created quality chances throughout but Larkin was having no part of it. LINEUP CHANGES: Corbett was a head-scratching scratch up front, as Johnson was not only back on the lineup card but moved to the top line with Green and Melnick. The move didn’t seem to affect the duo, as each went 1-1-2. Mohs was also back in the lineup, dressing for the fourth time this season. Grant Frederic did not play after skating in the finale vs. UMass-Lowell. FINAL THOUGHTS: True, Miami hasn’t played an NCHC contest yet, and this hasn’t been as a brutal of a non-conference schedule as in 2017-18 but considering the RedHawks’ off-season, 5-2 is a solid start. Miami should’ve beaten Colgate and it did. Same with Alabama-Huntsville, same with Mercyhurst. Sounds axiomatic, but at times in recent seasons the RedHawks have underachieved against lesser-skilled opponents. And this is another example of Miami not only getting into the win column but leaving little doubt late. In this game plus the three others vs. UAH and Mercyhurst, the RedHawks have scored five times in the third period. MU’s lead after 40 minutes has been at least two in all four of those contests. That means Miami is establishing the lead in the opening two periods and pulling away late. Will the RedHawks be able to keep that MO against its league foes, all of which will be better than Colgate? We’ll see, but winning these October non-conference games in decisive fashion has to give the RedHawks confidence heading into NCHC play. WHO: Colgate Raiders (2-1) at Miami RedHawks (4-2). WHEN: Friday – 7:35 p.m.; Saturday – 5 p.m. ALL-TIME SERIES: Miami leads, 4-2.
COLGATE RADIO: Both nights – WKXZ-FM (93.9), Hamilton, N.Y.
NOTES: After this weekend, Miami will have faced off against two of the most tenured coaches in Division I. Don Vaughn is in his 26th season at Colgate’s helm, and last season he became the 24th coach in NCAA hockey history to win 400 games. Rick Gotkin is in season 31 behind the bench for Mercyhurst. Colgate’s apex in recent history was the middle part of this decade, when the Raiders ran off 20-plus wins in 2013-14 and 2014-15, qualifying for the NCAA Tournament in 2014. But each of past three seasons, Colgate has failed to finish above .500 or advance past the quarterfinal round of the ECAC Tournament. The Raiders won their first two games of 2018-19 – home victories over New Hampshire – by identical 2-1 scores. Colgate struggled in its lone road contest vs. RIT last weekend, falling 6-1. Forwards Bobby McMann, Tyler Jeanson and Adam Dauda all have a goal and an assist to tie for the team lead at two points. McMann and Dauda were 1-2 in scoring for the Raiders last season with 30 and 19 points, respectively. Jared Cockrell and Tyler Penner have both found the net for Colgate among the forward corps. The Raiders are hoping for more output from this group, as the team has scored just five times or 1.67 goals per contest, and the defensemen have contributed just three points, all on assists. Defenseman Jacob Panetta has a pair of assists and Trevor Cosgrove has picked up one helper. Cosgrove finished with five goals and 12 assists in 2017-18. Nick Austin led Colgate in defenseman points with 18 last season but he has not played in any of the first three games. Goalie Mitch Benson has started all three games for the Raiders, but he was pulled after allowing five goals on 19 shots last week vs. RIT. 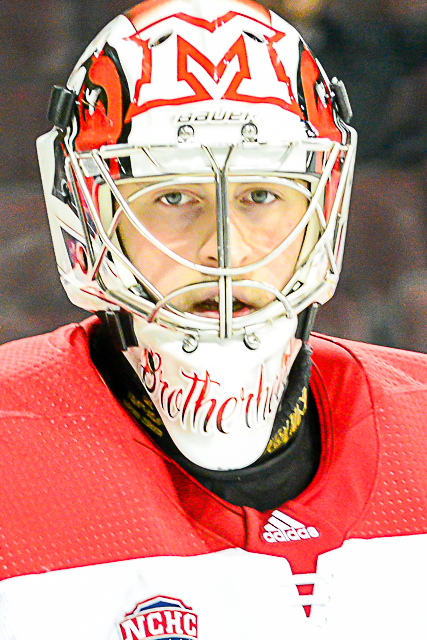 Despite being pulled after two periods in that outing, he is 2-1 with a 2.63 goals-against average and a .905 save percentage. All three Colgate netminders are freshmen. Andrew Farrier stopped turned aside six shots and allowed one goal in relief of Benson last weekend in his collegiate debut. Will Friend is the third goalie for the Raiders. The RedHawks have struggled offensively as well, as they have scored just five times in their last four games. Miami is ranked No. 46 on the power play at 9.7 percent but sixth on the penalty kill (90.5 percent). These teams last met at Cady Arena in 2012, a series in which the RedHawks outscored Colgate, 8-1 in a weekend sweep. Light the Lantern! Miami opens 2012-13 season with impressive non-conference sweep of Colgate. Behind another stellar goaltending performance by one of their freshman and five goals from five different players, #8 Miami completed an opening weekend sweep with a 5-1 victory over the Colgate Raiders. As in Friday’s game, one of Miami’s heralded freshman goaltenders stymied the Raiders as Jay Williams made 2o saves while surrendering just one first period goal as Miami rallied from an early 1-0 deficit to score five unanswered goals. Sophomore Cody Murphy notched three assists for a career high, and Kevin Morris and Riley Barber collected their first collegiate goals. Miami’s other tallies came from junior Bryon Paulazzo, his second of the year, sophomore Blake Coleman (3rd) and sophomore Alex Wideman (1st). Coleman had a weekend line of 3-1-4 in a bid to earn the conference’s weekly offensive player award while the Miami penalty killers were a perfect 13-for-13 in the two game sweep. Next weekend, Miami remains in non-conference action at home as the Providence Friars from Hockey East travel to Oxford to take on the RedHawks. Last season, Miami defeated Providence 6-2 in the first game of the Denver Cup at Magness Arena en route to capturing the tournament title. Blake Coleman notched two goals in the game and Jimmy Mullin tallied to lead Miami to the win. Curtis McKenzie was again absent from the Miami lineup. MURedHawks.com has a full recap HERE. USCHO.com has a full recap HERE. Read Colgate’s official recap HERE. Looking completely “as advertised,” Miami freshman netminder Ryan McKay made 24 saves and Blake Coleman added two goals as Miami shutout Colgate 3-0 at Steve Cady Arena on Friday night. Wearing 90s throwbacks, and the number 35, McKay could have been confused for former Miami goaltender Mark Michaud for those old enough to remember, as he efficiently turned away each Raider chance. McKay comes to Miami with an incredible resume. Playing the last three seasons with Green Bay of the USHL, McKay backstopped the Gamblers to the Clark Cup title in 2011-12 as Green Bay notched a league record 98 points last season. During his time in along the shores of Lake Superior, McKay’s “worst” goals against average was 2.20 and “worst” save percentage was .909 as he was named the recipient of the Dave Peterson Goalie of the Year by USA Hockey and the USHL’s Co-Goaltender of the Year sharing the honor with the Fargo Force’s Zane Gothberg – now with North Dakota. McKay helped the Gamblers reach the Clark Cup finals each year he was on the team winning twice. Sadly, my review is woefully incomplete because Miami’s new internet partner through IMG Sports’ partnership with Neulion was interweb inept. The video feed was so terrible that it was unwatchable. For the entire first two periods the feed “skipped” and at that point, I would have settled for the past’s awful quality just to listen to Dave Allen and at least be able to see the action. Hockey is the most important sport on campus. Get it fixed and now because Mike Commodore, and others, pay real American dollars for this stuff. As for the game, Miami’s many new faces will undoubtedly need time to gel, it’s expected the team will be led by the back end and McKay. But, the offense found a spark from sophomore Blake Coleman who opened the scoring at the 13:02 mark of the first period with assists from senior transfer Marc Hagel and sophomore Alex Wideman. Coleman’s goal was the only one tallied in the first period as Miami took a 1-0 lead into the locker room. Miami added two goals in the second period as junior Bryon Paulazzo notched his first on an assist from sophomore Austin Czarnik and Coleman would add his second of the night, unassisted, with just 1:15 left in the second to effectively seal the deal. Typically, Miami was whistled for a game-high nine penalties but killed all eight Colgate powerplay chances. The Raiders did lose freshman forward Mike Borkowski to a game misconduct for contact to the head in the second period but the RedHawks were unable to convert on the ensuing 5-minute major penalty. Miami was 0-for-4 with the man-advantage on the night. It was the first time in program history that Miami opened a season winning in shutout fashion. Not a bad start for the youngster from Palatine, Ill.
Tonight, the RedHawks look to improve to 2-0 and again host the Colgate Raiders at 7:05pm. Let’s hope Miami IMG and Neulion figure out the interwebs for the betterment of all mankind. Rachel Lewis of Triple Deke Photography has a game photo gallery that can be found HERE. McKay’s shutout was certainly the first ever for a Miami goaltender in an opener, but I need to do a little more research to determine if it’s the first time a goaltender has made his Miami debut and finished with a shutout. Blake Coleman now has 14 goals in his first 40 games as a RedHawk. Junior Bryon Paulazzo’s contribution to the evening is huge. If Miami can get scoring from the California native, that should ease some of the pressure off the sophomores and freshmen. The RedHawks started nine new-to-the program players including senior transfer Marc Hagel, three freshman defensemen and a freshman goaltender. Wow. Senior forward Curtis McKenzie was strangely absent from Friday’s lineup. Yes, tonight the #8 Miami RedHawks kick off their 2012-13 season hosting the Colgate Raiders of the ECAC in non-conference action. And, boy will we see some unfamiliar faces suiting up for the red and white as 11 freshmen don the opening night roster for Miami along with senior transfer Marc Hagel (Princeton). Most notably, will be the difference in net where for the first time since the 2007-08, someone other than Cody Reichard or Connor Knapp will man the Miami goal as freshmen Ryan McKay and Jay Williams inherit the crease from the highly decorated outgoing pair. Up front, Miami moves on after the graduation of grinding leaders like Trent Vogelhuber and Alden Hirschfeld and the early departures of Reilly Smith and Tyler Biggs. However, the RedHawks welcome highly skilled forwards Riley Barber and Sean Kuraly to a lineup featuring returning stars Jimmy Mullin, Blake Coleman and Austin Czarnik. If there was another team in the nation that can relate to the changes that Miami is enduring to its roster, it is Colgate. So, the real question for Colgate is, who will score? Well, they began to craft an answer as the Raiders thoroughly thrashed Niagara 10-2 on Tuesday night. In doing so, the Raiders scored the most goals in a game in 14 years as seniors Kurtis Bartliff, Billy Rivellini and Robbie Bourdon scored two goals apiece and Mihalik made 18 saves en route to the blowout victory in front of 735 strong at Starr Hockey Rink in Hamilton. This season Colgate is expected to be led by sophomore forward Joe Wilson (10-13-23) who played alongside Smith and Wagner and senior defenseman Jeremy Price. But, if others like Bartliff, Rivellini and Bourdon can contribute and Mihalik is solid in net, the Raiders could have a surprising year as they have been picked to finish in the bottom half of the surprisingly competitive ECAC standings. In terms of this weekend, I’m calling a split here with Colgate winning tonight 2-1 and Miami returning the favor 4-2 tomorrow night in Oxford. Last season the teams split a pair of games in Hamilton after Miami blew a lead and lost the game in overtime on Saturday night or they would have swept the Raiders on their home ice. For Miami, it will be interesting to see how quickly all the new names and faces mesh. There is a ton of talent on this team, but they are young and inexperienced. This will be a good non-conference test against another young, fast team. Overall, this should be a fun and exciting season of Miami hockey. After this weekend’s split with Bemidji State, Miami finds itself 5th in this week’s USCHO.com poll. Considering the number of freshmen on this team, and what we lost from last year, this feels like a much better spot for the RedHawks than the lofty preseason #1 or #2 that was bestowed in most polls. This weekend, Miami travels to Hamilton, N.Y. to take on #21 Colgate, the freshly minted champions of the Mutual of Omaha Stampede who defeated Robert Morris and host Nebraska-Omaha over the weekend at the CenturyLink Center in Omaha. Redskin Warriors will have a preview of the series available later in the week.